Is It Possible to Have Panic Buying? "Panic selling" is easy to understand and recognize: Investors rush to sell from the fear of loss. No more explanation necessary. On the other hand, "panic buying" is not easy to see for what it is. The phrase seems to clash with itself. People commonly assume that "buying" involves rational choices by investors, who assess risk, calculate entry points, establish stops, etc. None of that happens in a panic. So how can you have "panic buying"? For starters, you have it when fear actually motivates investors to buy. Whereas fear of loss motivates panic selling, investors get in a buying panic when they’re afraid of missing out on the profits they see everyone else making. Such as, for example, panic buying in the silver market from late January through late April of this year. Buyers drove prices from $26.40 per oz. (Jan. 28) to $49.80 (April 25), a gain of more than 80 percent in under three months. You probably have a good idea of what followed in the first week of May: more than half those gains vanished in four trading sessions. The direction changed, but the emotion did not. Fear inflated and deflated the same bubble. This excerpt from Elliott Wave International’s free issue of Global Market Perspective depicts that panic. 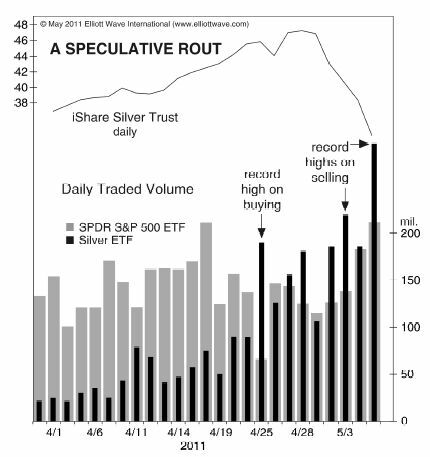 The chart below shows that daily trading volume in the exchange-traded fund, the iShares Silver Trust (SLV), surged to a record 189 million shares on April 25, days prior to silver’s peak. Then, just a few days after the peak, on May 5, it reached nearly 300 million shares, another record. The first record was on buying fever, the second on a selling panic. As shown on the chart, both levels far surpass the daily trading volume in the S&P 500 SPDR (SPY), which is generally the most heavily traded fund in the world. Through Wednesday, seven out of the past nine days have seen the daily volume in SLV outpace that of SPY. This is unprecedented behavior. “Day traders are going crazy,” says the head of trading at one brokerage firm. “Investors who felt they may have missed the boat with gold have jumped into silver because it has a better price point,” said a precious metals analyst. A Bloomberg story attributes the rise in SLV’s volume to “worries about inflation and the weakness in the U.S. Dollar.” But the real reason, in our view, is simply the same old mania story. Higher prices in silver got people more excited about the prospects of even higher prices, as they always do. The excitement hit a speculative crescendo when SLV reached a new high of 48.35 on April 28, unconfirmed by the price of the metal itself. Get the full story on Silver in the current issue of Global Market Perspective in a Special Section, titled "A Silver Bullet Sets Things in Motion." You can get the 100+ page issue FREE through May 31. It includes analysis and forecasts for world stock and interest rate markets, crude oil, metals, currencies and more. Download your FREE issue of Global Market Perspective now.